Initial Downside Targets Met in Russell 2000 (RUT), NYSE Composite (COMP). More Weakness Coming? The indexes we were specifically talking about in that report were the S&P 500 (SPX), Russell 2000 (RUT), and NYSE Composite (NYSE). RUT has since declined by 4.3% from Friday’s (Dec 14th) close to meet our 1350 target today. NYSE has since declined by 3.5% from Friday’s (Dec 14th) close to meet our 11,350 target today. SPX has already declined by 3.6% from Friday’s (Dec 14th) close, and by 7.2% since our December 6th Special Report entitled This Week’s Reversal Threatens A Much Larger Decline. That forward-looking report appears below. SPX still has an additional 2.3% to go to meet our 2450 target. Tuesday’s sharp downward reversal from critical overhead resistance at 2817 in the S&P 500 (SPX) has set up a potentially bearish chart pattern in the benchmark US index. A sustained decline below SPX 2643 would confirm it and would then target an additional 7% decline to 2450, or a total of 9% from Tuesday’s 2700 close. Chart 1 below plots SPX daily since July along with its 200-day (major trend proxy) and 50-day (minor trend proxy) moving averages. 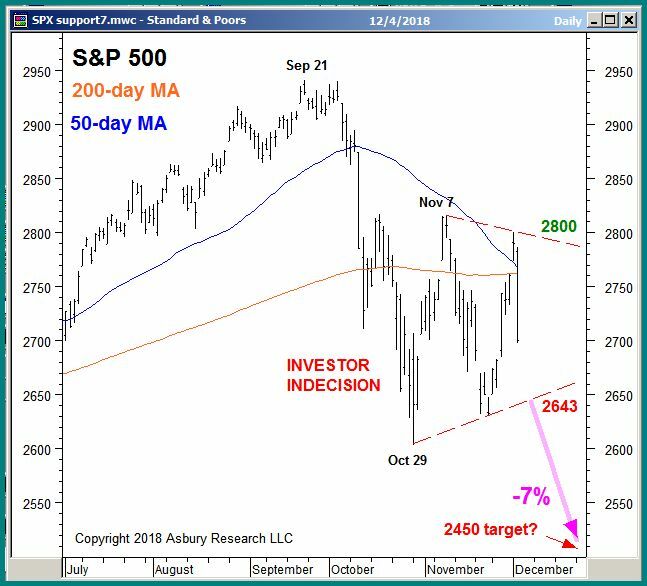 The red highlights show that the large, directionless gyrations of the past 5 weeks have formed a pattern of investor indecision that is bordered by 2800 above the market and by 2643 below it. A sustained decline below the lower boundary at 2643 would confirm a bearish resolution to this indecision and would target an additional 7% decline to 2450. We hope our market analysis helped Asbury Research Subscribers to avoid some of the recent market weakness. Feel free to contact us at any time to discuss our latest research, or your portfolio. 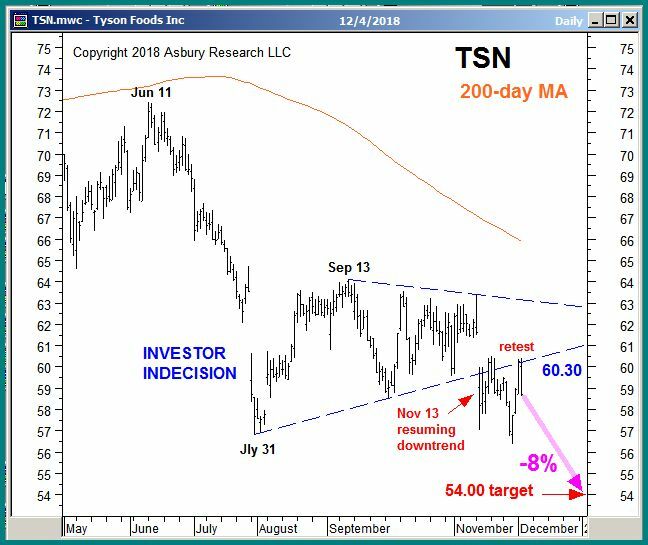 In our December 4th Asbury Alert, entitled Tyson Foods, Inc. (TSN): Resuming Late 2017 Decline (access requires subscription), we pointed out the retest of a November 13th breakdown from months of sideways investor indecision that targeted an additional 8% decline to $54.00 per share. Here is the chart from that report. This updated chart shows that our 54.00 downside target was met earlier today. 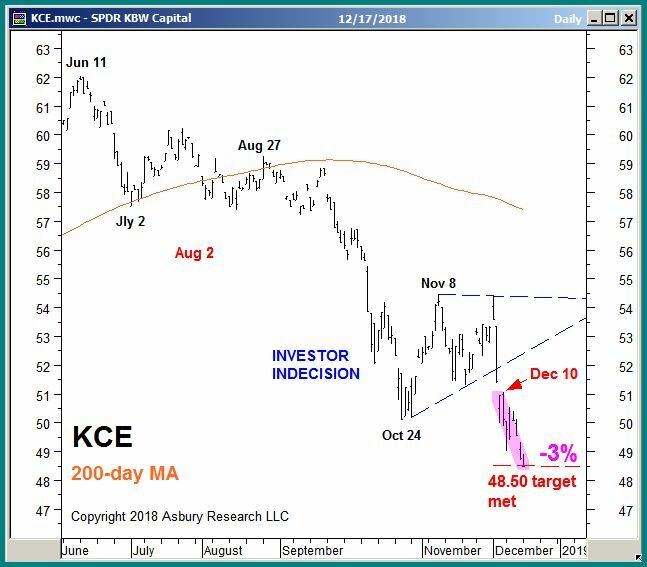 In our December 10th Keys To This Week report, we pointed out a breakdown from about 6 weeks of sideways investor indecision in KCE, which represents the capital markets segment of the S&P Total Market Index (“S&P TMI”) and tracks the performance of publicly traded companies that do business as broker-dealers, asset managers, trust and custody banks or exchanges. We said this breakdown indicated its larger August 2nd downtrend was resuming and targeted an additional 3% decline to $48.50. The chart above shows that our 48.50 target was met earlier today. to make everyone aware of a potential upcoming price reversal as price advances often end as upside targets are met and more savvy investors take profits. 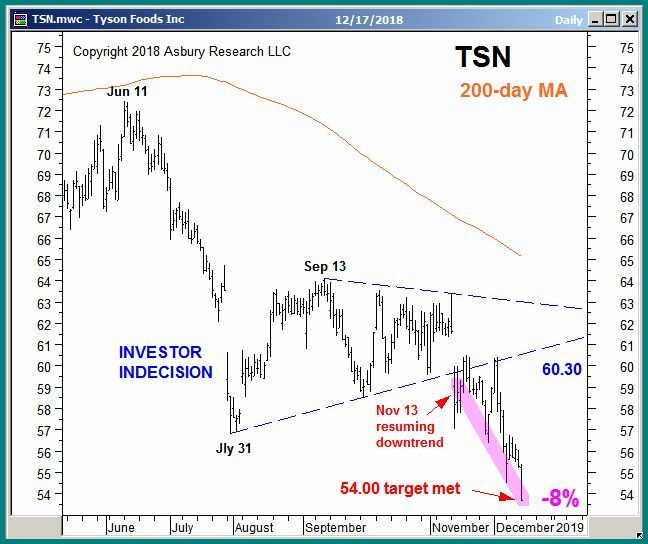 In early October we alerted Asbury Research subscribers of weakening market internals, and started protecting Asbury Investment Management (AIM) portfolios against a bearish reversal in what appeared to be a weakening US stock market. Less than a month later, the benchmark S&P 500 (SPX) had collapsed by 11% to 2604 by October 29th as shown in the chart below. The index subsequently ripped higher into the 2815 November 7th high and, as shown by the blue highlights, has been trading within those two extremes ever since. SPX has mostly been trading below its 200-day moving average, a widely-watched major trend proxy, which means the major trend is down (bearish). Corroborating Takeaway #2 is the fact that 57 of the 60 global stock markets we track are also trading below their 200-day moving averages. The red highlights on the chart show that, inside the past two months of of sideways trade, a smaller, triangular pattern exists, and that SPX is starting to trade below its lower boundary at 2655. This suggests the market is currently leaning downward, toward even lower prices, which would be confirmed by a sustained decline below 2604. A move below 2604 would indicate that the current major downtrend in SPX, which was initiated by the sharp October decline, is resuming. Should this occur, we will be watching key chart levels below the market, along with our key internal market metrics, for opportunities to reestablish long positions at much lower, and better, levels. The video below shows how we have navigated these choppy conditions for Asbury Research Management clients over the past several weeks. Click Here for our 12/13/2018 Video Review, which explains how we have used Asbury Research’s market analysis and investment ideas to professionally manage client portfolios. 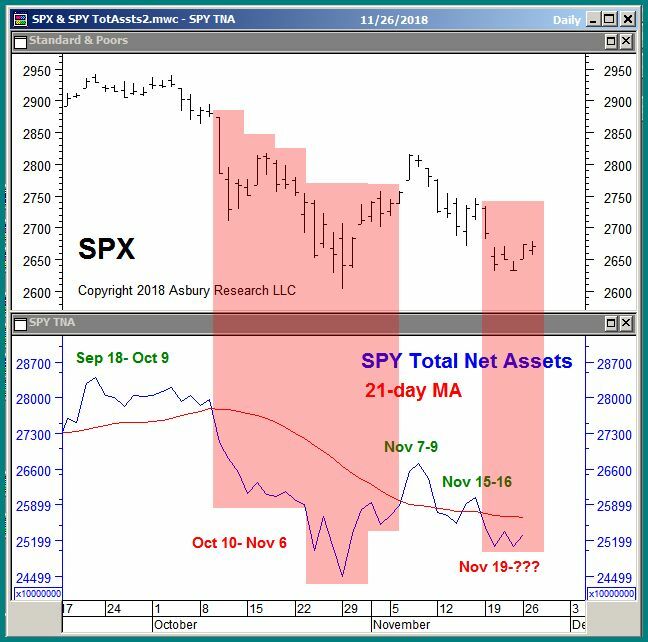 At the time of our previous November 8th Update, the benchmark S&P 500 (SPX) was in the midst of a corrective rebound following a sharp 11% decline between October 3rd and October 29th — a decline that we were fortunate enough to anticipate and, for the most part, avoid. 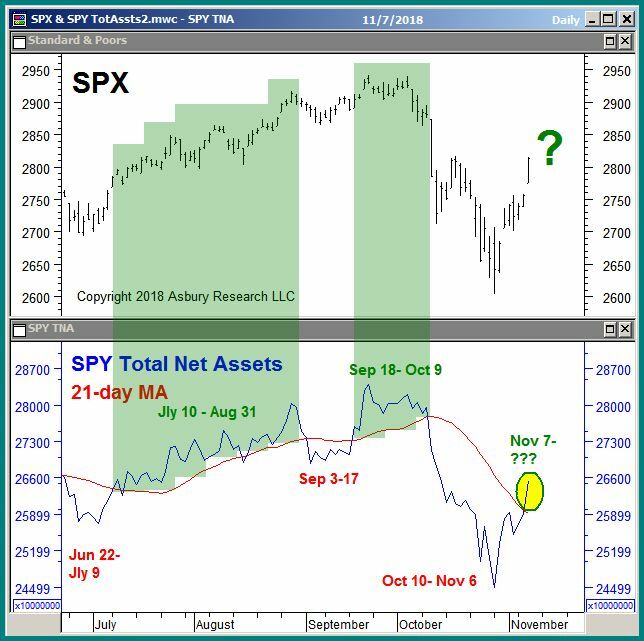 In that update we pointed out that the daily total net assets invested in the SPDR S&P 500 Trust ETF (SPY, which tracks the S&P 500) had just moved back above their 21-day (monthly, our tactical time frame) moving average to indicate an emerging trend of monthly expansion, similar to that which fueled the previous broad market rally from mid September to early October. Editor’s Note: The total net assets invested in SPY are one of our “Asbury 6” key market internals. We update the Asbury 6 every day and make them available to Asbury Research subscribers. The chart below, an updated version of the one from our November 8th Update, shows that these assets have since declined back below their 21-day moving average as of November 19th, indicating a new trend of monthly contraction and a Negative reading. 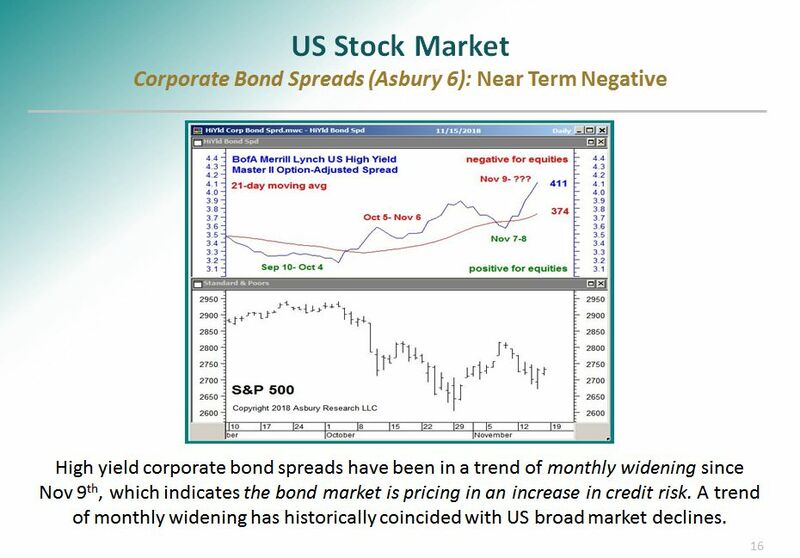 In addition, the other five market metrics that comprise the Asbury 6 are also currently in negative territory, collectively indicating a risk off mode. If and when these metrics move back to a positive (risk on) status, we will once again advocate a more aggressive stance in both our investment research (Asbury Research) and portfolio allocations (Asbury Investment Management). Until then, however, we remain in a defensive, capital preservation mode. Click Here for our 11/27/2018 Video Review, which explains how we have used our latest research to professionally manage client portfolios. In our October 22nd Research Excerpt, entitled The Put/Call Ratio: If The Market Can’t Rally Here, It’s In Trouble, we published one of the charts from our October Monthly Investment Compass (MIC, access requires subscription). Since then, SPX has declined by 101.00 points or 4%. The graphic below displays Slide 16 of 30 from our latest, November 17th Monthly Investment Compass. It shows that high yield corporate bond spreads have been in a trend of monthly widening since November 9th and — if you discount just two days of narrowing on November 7th and 8th — really since October 5th. The bond market is typically more forward-looking than the stock market. As a result, the S&P 500 has historically been unable to sustain rallies when corporate bond spreads are widening — which indicates that the bond market sees trouble ahead. Moreover, the longer the spread remains in a trend of monthly (our tactical time period) widening, the more likely the US broad market is to slip into a sustained bearish trend. Monday, November 12th marked exactly 4 months since our July 12th 2018 webinar for Fidelity Investments, entitled Asbury Research’s 2018 Mid Year Investment Update. In these webinars, which we have been regularly presenting to a number of investment firms and professional organizations since 2015, we show serious investors some of the tools that a veteran market strategist uses to improve investment performance while also protecting assets, and hopefully teach them how to be better informed and more successful investors. The following market analysis is taken from the Executive Summary of our July 12th webinar for Fidelity (black text), followed by how the financial markets we discussed have fared since then (red highlights). Despite recent geopolitical jitters,the US stock market is still in the midst of positive trends in most indexes, and amid mostly favorable technical/quantitative conditions for more strength. Specifically, we are expecting the benchmark S&P 500 (SPX) to rise by as much as an additional 7%. The S&P 500 proceeded to rise by an additional 6% into the 2941 September 21st high. Large Cap stocks remain amid favorable conditions for upcoming relative outperformance versus the S&P 1500. Meanwhile, Small Cap is at opposite over-loved extremes and thus vulnerable to upcoming relative underperformance versus the S&P 1500. Since July 12th, the iShares LargeCap S&P 500 ETF (IVV) has outperformed the iShares S&P 1500 Index Fund (ITOT) by 27% through October 24th. Meanwhile, the iShares S&P SmallCap 600 Index underperformed the iShares S&P 1500 Index Fund (ITOT) by 21% also since October 24th. We are currently overweight Utilities, Consumer Staples, Health Care and Real Estate, and are outright positive on Consumer Discretionary. No one can see into the future, and no one gets the markets right all the time. We are certainly no exception. But we do firmly believe that our comprehensive blend of technical, quantitative and behavioral market metrics — combined with almost 40 years of experience — can help to identify good investing opportunities in all market environments and, more importantly, can significantly limit losses and protect capital during adverse market moves. Contact us to get more information about our research and services for professional and individual investors. In our October 25th report, we said that our Asbury 6 key market internals — as well as our Correction Protection Model (CPM) — were all in Negative territory as of early October, indicating a “risk-off environment” and a market that was vulnerable to a corrective decline. The benchmark S&P 500 (SPX) did indeed correct lower, by 11% between October 3rd and October 29th but, due to these timely signals from our metrics, we were able to 1) identify the danger for Asbury Research subscribers and 2) actually avoid most of the decline for Asbury Investment Management (AIM) clients. As it stands right now, however, both CPM and our Asbury 6 are indicating the internal condition of the market has significantly improved. One of our Asbury 6, ETF asset flows, is shown in the lower panel of the chart below. The rightmost green highlights show that the daily total net assets invested in the SPDR S&P 500 Trust ETF (SPY, which tracks the S&P 500) have moved back above their 21-day (monthly, our tactical time frame) moving average as of Wednesday, November 7th. This indicates an emerging trend of monthly expansion, similar to that which fueled higher prices in the S&P 500 (upper panel) from mid September to early October, and also from early July to late August. Expanding investor assets indicate investor conviction in higher prices. As long as this emerging new trend of monthly expansion continues, the current broad market rally from the late October lows is likely to continue. Click Here for our 11/8/2018 Video Review, which explains how we have used our latest research to professionally manage client portfolios. 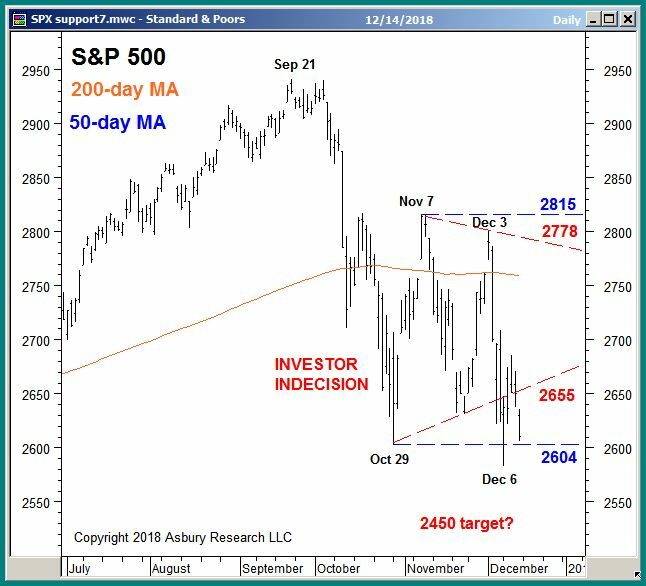 “The benchmark S&P 500 (SPX) begins this week right on top of minor underlying support at 2873 to 2863 while 3 of our Asbury 6 market internals have moved into negative (bearish) territory. Moreover, anther two of our Asbury 6 appear to be just another weak session or two away from also turning negative. A little more than 2 weeks later, the benchmark S&P 500 (SPX) has since collapsed by 234 points or 8.1.% and is now up just 1.2% for the year. Is this the buying opportunity we’ve been waiting for, or just the beginning of a very bad 4th Quarter? The good news is that SPX is currently testing underlying support at 2692, a level that we previously identified in our October 7th US Stock Market Update. These support levels are potential places for significant market bottoms to emerge. The bad news is that all of our Asbury 6 key market internals, per Table 1 one below, are in negative (bearish) territory. Our Asbury 6, which we update and make available daily in our research products, and are also a key component in our investment management decisions, measure the stock market’s internal strength in 6 different ways. As long as all Asbury 6 remain in negative territory, it suggests a “risk off” environment where we focus on protecting investor assets rather than putting new money to work. Click Here for our 10/24/2018 Video Review, which explains how we have used our latest research to professionally manage client portfolios. For further information about Asbury Research Management, please email contact@asburyinvest.com or call 1-844-4-ASBURY (1-844-427 2879).